The SonicWALL® E-Class Network Security Appliance (NSA) Series is the industry’s first multi-core Unified Threat Management (UTM) solution, delivering enterprise-class Reassembly-Free Deep Packet Inspection™ without significantly impacting network throughput. Combining a powerful deep packet inspection firewall with multiple layers of protection technology and a suite of high availability features, the E-Class NSA E7500, E6500 and E5500 appliances offer a broad range of scalable solutions for enterprise deployments in distributed environments, campus networks and data centers. 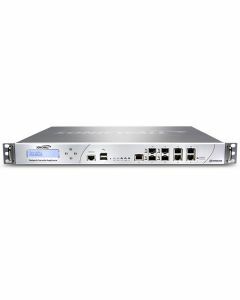 The SonicWALL E-Class Network Security Appliance (NSA) E8500 offers Dynamic Security for the Global Network by providing powerful application intelligence and control along with network intrusion detection and prevention.